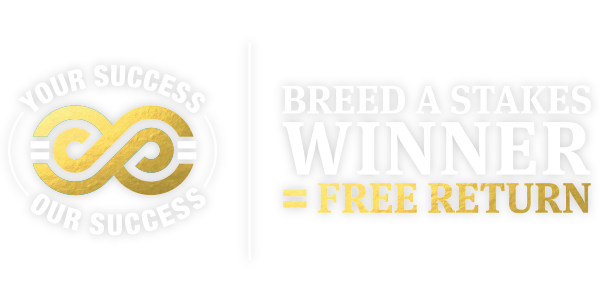 Sire of Group/Grade 1 winners ADMIRAL KITTEN (USA), BIG BLUE KITTEN (USA), BOBBY'S KITTEN (USA), CHIROPRACTOR (USA), DIVISIDERO (USA), HAWKBILL (USA), KITTEN'S DUMPLINGS (USA), OSCAR PERFORMANCE (USA), REAL SOLUTION (USA), ROARING LION (USA), SADLER'S JOY (USA), STEPHANIE'S KITTEN (USA), and 29 Gr.2/Gr.3 winners. The Leading Turf sire in North America. Won Turf Classic Invitational Gr.1, Secretariat Stakes Gr.1, Breeder’s Cup Handicap Gr.2, Virginia Derby Gr.3, American Turf Gr.3, Palm Beach Stakes Handicap Gr.3. ROARING LION (USA) (2015 c. by Kitten's Joy (USA)), subject stallion. yearling by Spendthrift Farm for $550,000 at Fasig-Tipton. SCHIAPARELLI (USA) (f. by Ghostzapper (USA)), won 5 races at 3 to 5 years in U.S.A.
Stakes, Santa Anita, Gr.3 and third in Cool Air Stakes, Hollywood Park. MOULIN DE MOUGIN (USA) (f. by Curlin (USA)), won 4 races at 2 and 4 years in U.S.A.
third in Royal Heroine Stakes, Santa Anita, Gr.2. ALEXIS TANGIER (USA) (f. by Tiznow (USA)), won 4 races at 3 and 4 years in U.S.A.
Churchill Downs, Gr.3, Exacta Systems Dueling Grounds Derby, Kentucky Downs, L. Vionnet (USA) (f. by Street Sense (USA)), see above. Alamitos, R. and third in Golden State Juvenile Stakes (c&g), Del Mar. Queen Elizabeth II Stakes (Sponsored by Qipco) Gr.1, 1m - Ascot - dropped back in distance to beat I Can Fly and Gr.1 1m winners Recoletos, Lightning Spear, Laurens and Romanised (Irish 2,000 Guineas). Qipco Irish Champion Stakes Gr.1, 1m2f - Leopardstown - showed trademark turn of foot and superb attitude to beat six Gr.1 winners, including QIPCO 2,000 Guineas winner Saxon Warrior and QIPCO Prix du Jockey Club winner Study of Man. Juddmonte International Stakes Gr.1, 1m2½f - York - streaked clear to win by 3½ lengths from six Gr.1 winners, headed by Prince of Wales's Stakes and King George VI And Queen Elizabeth Stakes winner Poet's Word. Coral-Eclipse Gr.1, 1m2f - Sandown - overcame wide passage to mow down Saxon Warrior and other dual Gr.1 winners Hawkbill (inc. 2016 Coral-Eclipse) and Happily. Dante Stakes Gr.2, 1m2½f - York - won by an easy 4½ lengths. Investec Derby Gr.1, 1m4f - Epsom - beaten just 2 lengths behind Masar and Dee Ex Bee. Craven Stakes Gr.3, 1m - Newmarket. Qipco 2000 Guineas Stakes Gr.1, 1m - Newmarket. Juddmonte Royal Lodge Stakes Gr.2, 1m - Newmarket - continued his rapid progress in beating next-time-out Stakes winners Nelson and Mildenberger. Racing Post Trophy Stakes Gr.1, 1m - Doncaster - beaten a neck by Saxon Warrior. Novice Stakes, 1m - Kempton - by 6 lengths. Novice Stakes, 1m - Newmarket - the same race in which the mighty Frankel made his own debut. To register your interest in sending a mare to Roaring Lion just click on the box below and send us your enquiry.